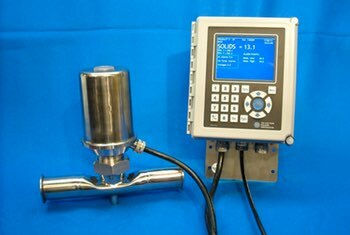 The MPR E-Scan is used to monitor and control solids or Brix from evaporation stages up to a concentrated final product. The production of sauces, ketchup and other tomato based products may also be measured. The suggested adapter for most installations is our sanitary-type, designed and manufactured to appropriate 3-A Sanitary Standards. If coatings are an issue, a steam port can be added to the adapter to allow the prism to be steam cleaned at specific intervals.